In the world of elementary particles, traces of a potential "new physics" may be concealed in processes related to the decay of baryons. Analysis of data from the LHCb experiment at the Large Hadron Collider performed by scientists from the Institute of Nuclear Physics of the Polish Academy of Sciences in Cracow have, however, shown that one of the rarest decays of baryons containing the charm quark so far shows no anomalies. Baryons, which are composite particles made of three quarks, can decay into lighter particles. These types of decays usually occur indirectly via the intermediate state (resonant). Sometimes, however, the decay proceeds directly in one step (nonresonant). The Standard Model predicts that some nonresonant baryon decays are extremely rare—depending on the type of baryon, they should occur once per billion cases, or even less frequently. "If the frequency of some nonresonant decays were to be different than predicted by the Standard Model, it could indicate the existence of processes and particles not known yet, and indicate the existence of 'new physics.' This is why nonresonant decays have attracted our attention for so long," explains Prof. Mariusz Witek from the Institute of Nuclear Physics of the Polish Academy of Sciences (IFJ PAN) in Cracow. Prof. Witek led a five-member group of physicists from Cracow searching for nonresonant decays of charmed baryon Lambda c in data collected in 2011 and 2012 by the international LHCb experiment at the Large Hadron Collider in Geneva. In the study, the researchers focused on Lambda c baryons, i.e. particles made of down (d), up (u) and charm (c) quarks. The most massive top (t) quark decays so quickly that it does not combine with other quarks at all, so it does not create baryons, whose decays could be observed. The decays of particles containing the second largest quark in terms of mass, the beauty (b) quark, has already been analyzed earlier on, because their decays were slightly easier to detect. The Cracow group was involved here and contributed to observation of interesting deviation from theoretical predictions. In this situation, only the decays of charmed baryons remained largely unexplored. "The Standard Model predicts that nonresonant decays of Lambda c baryons into three particles—a proton and two muons—should occur more or less once in hundreds of billions of decays. 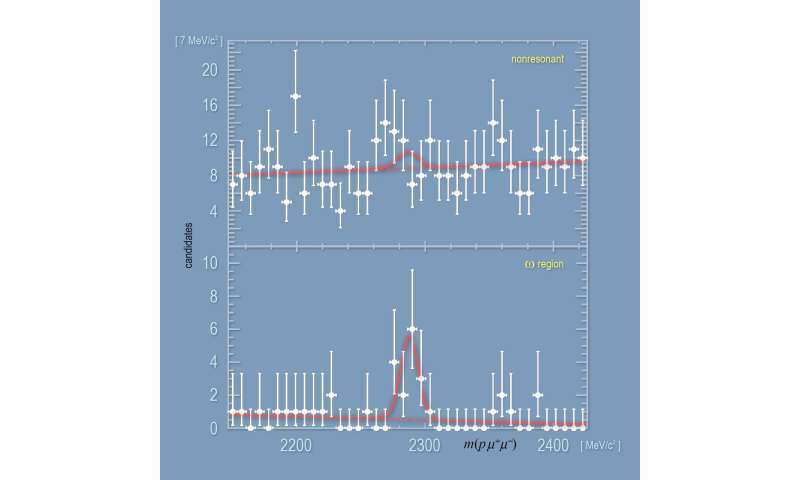 This is a much rarer phenomenon than the decays of baryons containing the beauty quark, which we were analysed earlier," says Dr. Marcin Chrzaszcz (IFJ PAN). "Measurements and analyses are now much more difficult. We have to look into a much larger group of events registered in the LHCb experiment. However, it is worth doing, because as a reward you can come across a trail of much more subtle processes. If we manage to observe any inconsistencies with predictions, this would most likely be a signal of a 'new physics.'" With such rare phenomena, the distinguishing of nonresonant decays of Lambda c baryons from the background has proved to be a hard and time-consuming task. Nonetheless, the Cracow-based physicists have managed to improve an upper limit on frequency of nonresonant decays by up to 100 times. It was estimated to be less than one in hundreds of millions. "The taking into account of additional data, including the second run of the LHC accelerator, should soon improve our result by a factor of 10. So we would be very close to the predictions of the Standard Model. If some sort of 'new physics' is manifesting itself in the decays of Lambda c baryons, this will be the last chance for it to reveal itself. At present, there is not the slightest trace of it," sums up Prof. Witek. During the analyses, the Cracow-based researchers also observed resonant decays, in which the Lambda c baryon decayed into a proton and omega meson. The lack of signals indicating yet another path of resonant decay—into a proton and a rho meson—was somewhat surprising. However, this result turned out to be in line with theoretical predictions.